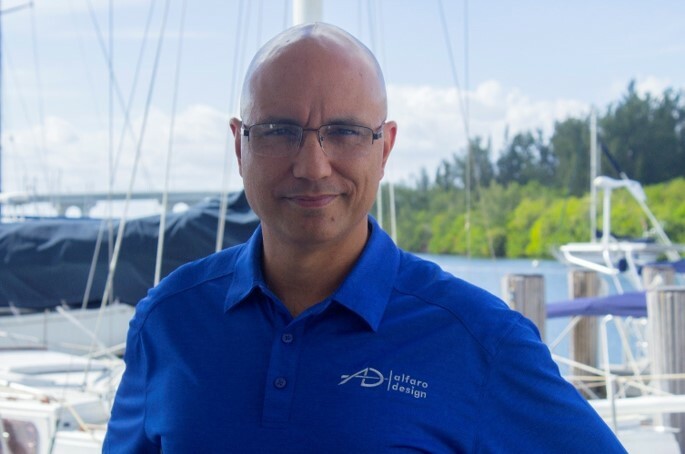 Earl Alfaro is a marine industry veteran whose career spans over the past 29 years, participating in the design of yacht and small-craft ranging in size from 25′ thru 150′. ‘Alfaro Design LLC’ was created and launched to supply boat manufacturers, yacht designers, naval architects and custom boat buyers with a technical and creative resource that compliments existing design teams or serves as a full-service design center. Whether it be vessel design, photo-realistic rendering, 3D modeling, drafting, or consulting, ‘Alfaro Design’ is uniquely positioned to meet their needs. Working from within both yacht design studios and in manufacturing facilities over the years has provided the unique experience and exposure to the variety of practices essential to boat building, design and engineering. This, in turn, translates into a significant level of practical experience applied throughout the design and creative process. His educational and professional experience includes a technical certification in yacht design, small-craft naval architecture and marine engineering from the Westlawn Institute of Marine Technology as well as employment with some of the industry’s premier companies such as Tom Fexas Yacht Design, Intermarine Savannah, Pursuit Boats, and most recently with Grand Banks Yachts. Earl is a member of ABYC, the Royal Institute of Naval Architects (MRINA), Society of Naval Architects and Marine Engineers (Member-SNAME) and holds a Six-Sigma Green-Belt certification.